Jack Allison was born on September 7, 1926, in Memphis, Tennessee. He enlisted in the U.S. Navy on November 1, 1943, and served as an Aviation Mechanic until May 15, 1946, when he left active duty and went into the Navy Reserve. Allison entered the Aviation Cadet Program of the U.S. Air Force on January 13, 1950, and was commissioned a 2d Lt and awarded his pilot wings at Reese AFB, Texas, on February 10, 1951. He then completed SA-16 Albatross training and then helicopter training before serving with the 56th Air Rescue Squadron in Morocco from June 1952 to January 1955. Allison then served as a helicopter pilot at Turner AFB, Georgia, from January 1955 to March 1958, when he became a test pilot. After attending Test Pilot School, he served at Brookley AFB, Alabama, from August 1958 to June 1962, followed by service at Ramstein AB, West Germany, until September 1965. He then served as Commander of Detachment 14, Eastern Aerospace Rescue & Recovery Center, at MacDill AFB, Florida, from September 1965 to September 1967. He flew combat missions in the HH-53B Super Jolly Green Giant with the 37th and then the 40th Aerospace Rescue & Recovery Squadron at Udorn Royal Thai AFB, Thailand, from September 1967 to October 1968. 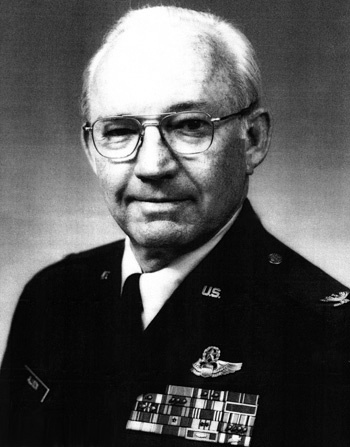 Col Allison served with the 48th ARRS at Eglin AFB, Florida, from October 1968 to June 1971, and then served as Commander of the 1551st Flying Training Squadron at Hill AFB, Utah, until March 1973. While at Eglin, Col Allison participated in the Son Tay Raid on November 21, 1970. He was Vice Commander of the 1550th Air Training & Test Wing at Hill AFB from March 1973 to January 1974, and then Deputy Commander for Operations until July 1974. Col Allison's final assignment was as Director of Safety with Headquarters Aerospace Rescue & Recovery Service at Scott AFB, Illinois, from July 1974 until his retirement from the Air Force on August 31, 1978. Jack Allison died on November 2, 2011, and was buried at Arlington National Cemetery. The President of the United States takes pleasure in presenting the Air Force Cross to John V. Allison, Lieutenant Colonel, U.S. Air Force, for extraordinary heroism in military operations against an armed enemy of the United States as Aircraft Commander of an HH-53 Rescue Helicopter of the 40th Aerospace Rescue and Recovery Squadron, 3d Aerospace Rescue and Recovery Group, as part of an all-volunteer joint U.S. Army and Air Force raiding force in the Joint Chiefs of Staff-directed heliborne assault mission to rescue United States military personnel held as prisoners of war at Son Tay prison in North Vietnam, on 21 November 1970. On that date, Lieutenant Colonel Allison flew a helicopter loaded with Special Forces troops into an extremely hostile environment. Prior to landing, he recognized that circumstances existing in the vicinity of the objective were considerably different than expected. He correctly assessed the new conditions, and at risk of life under adverse circumstances and without direction, implemented an alternate plan. Acting on his own, Colonel Allison's decision to undertake a new plan and deliver sustained accurate fire on the major enemy threat, a guard billet played a large part in the tactical success of the operation. After all buildings were searched, Colonel Allison, without regard for his personal safety, landed and picked up and safely returned his troops through heavy surface-to-air missile activity. Through his extraordinary heroism, superb airmanship, and aggressiveness in the face of the enemy, Lieutenant Colonel Allison reflected the highest credit upon himself and the United States Air Force.